Remember to Breathe in, and Breathe out Babe! Every woman wants to feel her very best the day she walks down the aisle and says "yes" to her best friend for the rest of their lives. And before I go any further, a message to every woman (Bride or not): YOU ARE BEAUTIFUL JUST AS YOU ARE. And you lucky girl, you found the one that loves you and chooses you for who you are! Remember that, ALWAYS! And babes that aren't walking down the aisle quite yet, you can still follow along, because I truly believe we deserve to give ourselves the very best at all times. The results: Feeling YOUR BEST at all times! Yes, yes, yes! Are you ready for some "shredding for the wedding" tips?! We're in that five week countdown to my wedding day (first anniversary though- where did the time go?! ), and I've been asked multiple times: "how did you physically get ready for your wedding?" And have thought it would be fun to share my personal story and some tips with all of you. Because I was busily planning my wedding last year at this time (in a little less than 15 weeks), I didn't have the time to share, but today is the day! In honor of how quickly we planned our wedding, I thought I'd base my "shredding for the wedding" tips on six weeks for any bride (or babe getting ready for vacation) feeling the hustle to physically feel great on that day of your special occasion! Like I mentioned above, let's be realistic, and not drastic. Let's make this sustainable to keep you feeling this feel good in your skin "high" long after the wedding or bathing suit season. Plus, you don't want to miss important memory-making moments leading up to the special day or memory-making festivities by not being able to enjoy, and definitely no fainting girlfriend!! AND not too drastic for that gorgeous dress you bought that fit you just right the day you bought it! Pull out a pen and paper. Write yourself a note. I want you to list 3 things that you appreciate about this body of yours the way it is today as you begin "shredding for the wedding". Also jot a few things you know your significant other loves about you- we don't want to lose sight of that! (Single ladies, focus on some self love here!) Now write down your goals for the next several weeks (everything we're going to do can honestly be done at any time from one week to a lifetime, besides "cleansing"). Put this note somewhere you'll see it daily. Use this as motivation, but also as a love letter of encouragement to yourself! To feel my very best on my wedding day. Bright, Light, and Glowy from the inside out. To look and feel strong. WATER!!! Every day, all day! No more than 1 coffee a day, add in my collagen and coconut oil daily. Drink water for extra energy. Eat energizing meals! ex: LOTS of greens, complex carb, healthy fat, protein. Big breakfasts! Move Daily!! I scheduled my hot yoga, barre classes, and runs! But on days I would have other things planned or needed to be more restful. I would walk, or ask Tay to go on a bike ride with me. Breaking a sweat at least 5 days a week was my goal. Rest: ask for help and plan date nights to check out and not talk wedding! Beauty Sleep. In bed by 10 PM! Enjoy- have fun in this season. Be present! Sometimes eggs if you have a hunch they don't make you feel well- Eggs are not bad however, just a common food sensitivity. If you are eating eggs please upgrade eggs to be eating Pasture Raised Eggs! Hydrate: The most bland but important bit of advice I can share: DRINK WATER. I'm not talking a whole day's worth of carbonated water, iced teas, etc. I'm talking the real stuff, good ol' H2O! My rule of thumb for myself and my clients is: Water before any other beverage. Here's the magic number I use for calculating your daily goal for your water intake: 1 liter (about 34oz) of water per every 50 lbs of our body weight. So, easy example: if you weigh 100 lbs, that's 2 Liters. Start in the morning. You may not feel thirsty, but I promise you, your body is. Your organs need it!! Baby steps. Awareness: Reach for foods that aren't found in packages. BUT if you are reaching for packaged foods, read the ingredients. Make sure you recognize them. And also, just check to see how much sugar is in this food! This could be an eye opener. Sweet Cravings: When craving sweets, keep organic berries and green apples on hand! Not only are they full of excellent nutrients and antioxidants, but they are low-glycemic. I love to pair my berries or green apples with a healthy fat! Example: warm up coconut butter and drizzle over the top of berries. And green apples dipped in some cashew or almond butter is also a fav! Be Prepared: Stock up on the good stuff! Find some staples that work for your lifestyle that you can make a few quick and tasty meals out of that won't leave you feeling lousy. I keep some fun/easy tips and recipes on my instagram story highlight called: Quick Meal Hacks - check those out for some ideas. Accountability & Knowledge: Work with a Nutrition Practitioner one-on-one for accountability to reach your goals. I'd be more than honored to work alongside you, as I'm a holistic nutrition health coach and have helped guide many brides to their wedding day goals. My services are not limited to brides of course, so I'd be happy to work with you wherever you're at in your nutrition and wellness journey. Inquire HERE. And when you receive an email from me with the health history, respond and let me know you read about me in this blog post and I'll give you $50 OFF your consultation! 80/20 Perspective: This is a BIG part of my daily lifestyle and I believe this is a super important element to approaching a healthy lifestyle, and having success reaching your goals. It's not about restriction, but it's about upgrades, and it's also about feeling balanced in life. Here's how this works: 80% of the time you feed yourself with the foods that fuel you. You fill your body with those real and whole foods. 20% of the time you can enjoy that glass of wine (or maybe champagne during this season), those gluten free brownies, or my fav… the gluten free pizza! Just remember, foods that hurt you, like really hurt you (for me that is gluten) don't belong in your 80/20. No need to put your body through a cycle like that. During my wedding planning my 20% was left for our celebrations and gatherings, food tastings, the cake tastings, as well as the special moments Taylor and I just needed to check out and enjoy some quality time together and raise a glass to one another and this season we were in! I highly recommend this! Stop Counting: I'm going to make this a short and sweet statement on my personal beliefs that counting calories/macros/fats, etc. can do more harm than good. I know this isn't true for everyone, so please take this with a grain of salt. But I believe approaching food and how you fuel your body should feel very freeing. Obviously the things we have been taught about food (ex: calorie in/calories out) can be so confusing and learning the facts here will be key. But I just do not believe in having to live life in restriction. Again, I'd be more than honored to offer my services to help you learn how to best fuel your body without having to live life counting and feeling that burden of obsession. For this reason, my biz partner and I have created a six week program called "Food Freedom". We recently just made this six week program available to anyone (usually done live over a size week period). In our program we give you the FACTS! We help break down obsessions and work towards freedom in this area. To learn more, click HERE. This program includes the DIYCLEANSE + so much more. So if you're really looking for some guidance, I'll be honest, this is the best bang for your buck. I'm very proud of this program we have created. Think. Our bodies were created to MOVE!! Have you ever really thought of that? Think of our ancestors wayyyy before us and how sitting in one spot all day or on a couch at night was not even an option. They had work that was physically tasking, and to travel anywhere it required movement. Only saying this to create perspective, because it has changed my approach to movement feeling like a burden or a task. The truth is, my body is always grateful for Movement. And this doesn't always mean a full blown exercise. Inspiration. I was totally inspired the other day when I heard Harry Connick Jr. mention (on the Today Show) that he has worked out every single day for the last 9 years for at least 20 minutes a day! (It might have been 30 minutes) He's made sure he has moved every single day since 2010, even when he's sick! I'm not saying we need to do this, but I was absolutely inspired. What 20 minutes of movement a day could do for your body, it definitely wouldn't hurt us! Make a Plan. No doubt about it, moving our bodies will help us reach our goals. But every single body is different. You know your capabilities (as of now), so be gentle, and have grace for what you can do in this moment. Start by making a plan. What is realistic for you? What is ideal? Can you carve out time for some movement 5 days a week? 7 days? Or just 3? How long can you give to that allotted time? What type of movement is best for you? Barre class, walking, pilates, yoga, running, a HIIT workout in your living room, being a gym member? Make a plan! Write it down. Schedule It. This has been a game changer for myself and my clients. Put your plan on your calendar. Schedule this time for yourself and cherish it. Treat that time for you as you would a coffee date with a friend, or a date night with your significant other. Never cancel unless you absolutely must. Value yourself and your time like that. Physically write on your calendar (or type it in if you're fully digital) what time, when, and what. You know your schedule, so it's up to you what you need to move around to make this happen for you. Show up. This is for YOU. I know how easy it is to press the snooze button when the alarm goes off to get you out of bed for your workout. I know how easy it is to drive home to the comfort of your PJ's and your couch and skip the workout you had planned. But I'm going to be brutally honest with you… it's gonna be that much harder to reach your goals if you don't show up for yourself. Nobody else can do this for you. As long as you listen to your body, because there are some days that your body just needs a break, so by all means- please listen. BUT again, your body was meant to move. If you're allowing yourself time to rest, and fueling yourself with real and whole foods, your body can find the energy. And here's my favorite part of this: YOU NEVER REGRET A WORKOUT!! This is truer than true. I set my alarm clock for 5am to begin my day with movement (usually barre class or hot yoga-sometimes both), 98% of the time getting out of bed is the HARDEST thing to do. But once I'm done I feel AMAZING!! The days I press snooze and don't show up for myself, that's when I regret it. You've got this girl. Not resting can impact your health journey greatly! This could very well be the most busy time in your life. You could be juggling multiple things, and the days just don't feel long enough to get it all done. I feel ya completely. Again, we planned our wedding in a little less than 15 weeks. But I'm here to tell you that Rest is going to be soooo important. This is important for all of you, even those that aren't looking to "Shred to wed." In our world today, there is an epidemic of Adrenal Fatigue, and from that we see sooo many other diseases stem. (This is a wayyy bigger topic than we are going to dive into.) But my point is that our bodies (and minds) don't get enough rest, and our hormones take quite the beating. This actually has a big affect on our struggles with weight loss and gain, so rest is very important. Prioritize. I know rest sounds impossible right about now, but I want to encourage you to do whatever it is is that you can to add "rest" to your schedule too. Perhaps this is 20 minutes of Quite Time: no phone, no tv, no nothing. Or maybe this is an hour of TV once a week just to mellow out. Or maybe this is a coffee date with a girlfriend, or a date night with your fiancé (or significant other), or a babysitter for those kiddos so you can just have a break. It doesn't need to be a whole day, or even hours, but girl- you need some time to do NOTHING but do something for you. Beauty Sleep. Obviously sleep is EXTREMELY important. Again, lack of sleep can be a big culprit in the struggle for weight loss and motivation. So do whatever you can to get the best night sleep possible. Now I'm not someone who believes I need 8 hours of sleep. I seem to actually thrive off of 6-7, so I'm not going to give you a specific amount of time to be aiming for. I can tell you you need more than 4. Haha. All those hormones and that body needs time to restore itself. BUT studies do show that the best time to to bed is 10pm. And the best time to rise is 6am. 2 Hours of sleep before midnight are worth 4 hours of sleep after midnight! Whoa! So get yourself all tucked in and shut things down before 10pm! If you have trouble shutting your mind down because of all the chaos and things to do, here's what works for me: Writing everything on my mind down onto a piece of paper/journal beside my bed. Not on my phone (cause then I'll end up checking instagram, e-mails, etc!). Writing my thoughts down helps me release what's on my mind knowing that I can pick those thoughts up in the morning. Water is also key for sleep! So go back up to that hydration tip!! Date night. I mentioned this above under prioritize, but I will say I felt rested and balanced when Taylor and I would take time to just stop and connect and talk about anything else besides the wedding! Be present. Have Fun. I think this has a big part in "shredding for the wedding" or whatever occasion you're aiming for. Stress can sit right in our gut. Let go of the things that you can't change. Do what you can without killing yourself over it. But most importantly, be present and have fun. Enjoy every second!! Re-visit that 80/20 perspective. I don't want you to miss out on those special occasions leading up to your big day. Allow yourself to raise a glass here and there as your day comes near, enjoy some nibbles at your cake tasting!! Enjoy babe. And congratulations to you and this very exciting time in your life! My Last Thoughts: This was a long one, but I hope you were able to build a plan and find some inspiration as you prepare for your big day. I could have gone so so so much deeper in every topic, and there is so much more to share, but my goal was to share my lifestyle and my greatest resources with you so that you could have the opportunity to feel your very best leading up to your special occasion and live your very best life on a daily basis by making some upgrades to your lifestyle. What I shared are things I live by, what I have done, what I teach, and what I do. Please use the resources I have plugged in, including my services if you feel the need for extra support, knowledge, accountability, or just the desire to go deeper. Wishing you the very best during this magical time! And babes that aren't Shredding for the Wedding— I hope that this time as you work towards your most confident self is magical too! You are worth it! 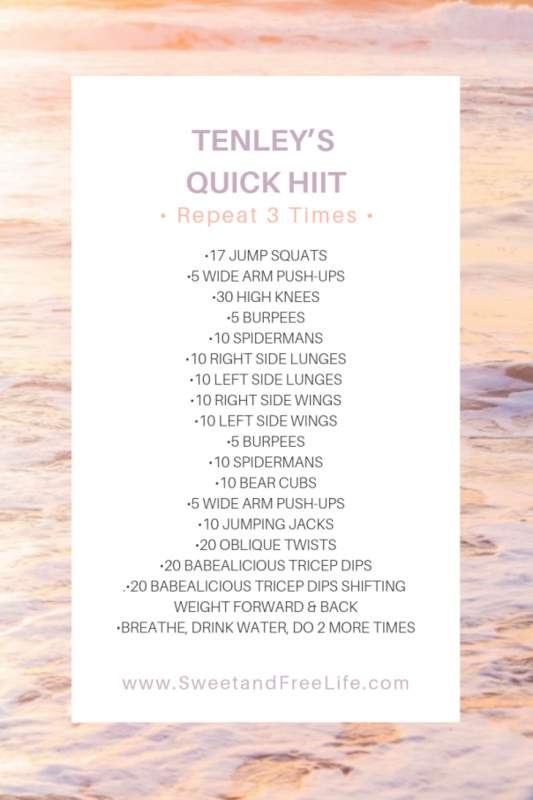 Here's a Quick HIIT Workout that you can do anytime and anywhere. I like to do this in my living room, at the beach, in hotel rooms. Anywhere! Screenshot and save on your phone when you need it! You'll do this 3x Total! Video to visually follow is on my IGTV HERE!